1. Answer A. Causes of deficient fluid volume include vomiting, diarrhea, conditions that cause increased respirations or increased urinary output, insufficient IV fluid replacement, draining fistulas, and the presence of an ileostomy or colostomy. A client with congestive heart failure or decreased kidney function, or a client receiving frequent wound irrigations, is at risk for excess fluid volume. 2. Answer D. Assessment findings in a client with a deficient fluid volume include increased respirations and heart rate, decreased central venous pressure (CVP), weight loss, poor skin turgor, dry mucous membranes, decreased urine volume, increased specific gravity of the urine, increased hematocrit, and altered level of consciousness. The normal CVP is between 4 and 11 cm H2O. A client with dehydration has a low CVP. 3. Answer B. The causes of excess fluid volume include decreased kidney function, congestive heart failure, the use of hypotonic fluids to replace isotonic fluid losses, excessive irrigation of wounds and body cavities, and excessive ingestion of sodium. The client taking diuretics, the client with an ileostomy, and the client who requires gastrointestinal suctioning are at risk for deficient fluid volume. 4. Answer C. Assessment findings associated with excess fluid volume include cough, dyspnea, crackles, tachypnea, tachycardia, an elevated blood pressure and a bounding pulse, an elevated CVP, weight gain, edema, neck and hand vein distention, altered level of consciousness, and a decreased hematocrit. 5. Answer B. Potassium-rich gastrointestinal fluids are lost through gastrointestinal suction, placing the client at risk for hypokalemia. The client with renal failure or Addison’s disease and the client taking a potassium-sparing diuretic are at risk for hyperkalemia. 6. Answer A. A serum potassium level lower than 3.5 mEq/L indicates hypokalemia. Potassium deficit is a common electrolyte imbalance and is potentially life threatening. Electrocardiographic changes include inverted T waves, ST segment depression, and prominent U waves. Absent P waves are not a characteristic of hypokalemia. 7. Answer D. Potassium chloride administered intravenously must always be diluted in IV fluid and infused via a pump or controller. The usual concentration of IV potassium chloride is 20 to 40 mEq/L. Potassium chloride is never given by bolus (IV push). Giving potassium chloride by IV push can result in cardiac arrest. Dilution in normal saline is recommended, but dextrose solution is avoided because this type of solution increases intracellular potassium shifting. The IV bag containing the potassium chloride is always gently agitated before hanging. The IV site is monitored closely because potassium chloride is irritating to the veins and the risk of phlebitis exists. The nurse monitors urinary output during administration and contacts the physician if the urinary output is less than 30 mL/hr. 8. Answer D. A serum potassium level higher than 5.1 mEq/L indicates hyperkalemia. Clients who experience cellular shifting of potassium in the early stages of massive cell destruction, such as with trauma, burns, sepsis, or metabolic or respiratory acidosis, are at risk for hyperkalemia. The client with Cushing’s syndrome or colitis and the client who has been overusing laxatives are at risk for hypokalemia. 9. Answer D. A serum potassium level higher than 5.1 mEq/L indicates hyperkalemia. Electrocardiographic changes include flat P waves, prolonged PR intervals, widened QRS complexes, and tall peaked T waves. 10. Answer B. Hyponatremia is evidenced by a serum sodium level lower than 135 mEq/L. Hyponatremia can occur in the client taking diuretics. The client taking corticosteroids and the client with renal failure or hyperaldosteronism are at risk for hypernatremia. 11. Answer C. Hyperactive bowel sounds indicate hyponatremia. Options A, B, and D are signs of hypernatremia. In hyponatremia, increased urinary output and decreased specific gravity of the urine would be noted. Dry skin occurs in deficient fluid volume. 12. Answer A. The normal serum calcium level is 8.6 to 10.0 mg/dL. A client with a serum calcium level of 4.0 mg/dL is experiencing hypocalcemia. The excessive ingestion of vitamin D and hyperparathyroidism are causative factors associated with hypercalcemia. End-stage renal disease, rather than renal insufficiency, is a cause of hypocalcemia. Prolonged bed rest is a cause of hypocalcemia. Although immobilization initially can cause hypercalcemia, the long-term effect of prolonged bed rest is hypocalcemia. 13. Answer A. Signs of hypocalcemia include paresthesias followed by numbness, hyperactive deep tendon reflexes, and a positive Trousseau’s or Chvostek’s sign. Additional signs of hypocalcemia include increased neuromuscular excitability, muscle cramps, twitching, tetany, seizures, irritability, and anxiety. Gastrointestinal symptoms include increased gastric motility, hyperactive bowel sounds, abdominal cramping, and diarrhea. 14. Answer C. Electrocardiographic changes that occur in a client with hypocalcemia include a prolonged ST or QT interval. A shortened ST segment and a widened T wave occur with hypercalcemia. Prominent U waves occur with hypokalemia. 15. Answer C. The normal magnesium level is 1.6 to 2.6 mg/dL. A magnesium level of 1.0 mg/dL indicates hypomagnesemia. In hypomagnesemia, the nurse would note tall T waves and a depressed ST segment. Options 2 and 4 would be noted in a client experiencing hypermagnesemia. Prominent U waves occur with hypokalemia. 16. Answer A. The normal serum phosphorus level is 2.7 to 4.5 mg/dL. The client is experiencing hypophosphatemia. Causative factors relate to malnutrition or starvation and the use of aluminum hydroxide–based or magnesium-based antacids. Malnutrition is associated with alcoholism. Hypoparathyroidism, tumor lysis syndrome, and renal insufficiency are causative factors of hyperphosphatemia. 17. Answer D. Clients experiencing nausea and vomiting would most likely present with metabolic alkalosis resulting from loss of gastric acid, thus causing the pH and HCO3– to increase. Symptoms experienced by the client would include hypoventilation and tachycardia. 18. Answer C. The normal serum amylase level is 25 to 151 units/L. With chronic cases of pancreatitis, the rise in serum amylase levels usually does not exceed three times the normal value. In acute pancreatitis, the value may exceed five times the normal value. 19. Answer B. The normal blood urea nitrogen level is 8 to 25 mg/dL. Values such as those in options C and D reflect continued dehydration. Option A reflects a lower than normal value, which may occur with fluid volume overload, among other conditions. 20. Answer C. Troponin is a regulatory protein found in striated muscle. The troponins function together in the contractile apparatus for striated muscle in skeletal muscle and in the myocardium. Increased amounts of troponins are released into the bloodstream when an infarction causes damage to the myocardium. A troponin T value that is higher than 0.1 to 0.2 ng/mL is consistent with a myocardial infarction. A normal troponin I level is lower than 0.6 ng/mL. 21. Answer C. The normal serum creatinine level for adults is 0.6 to 1.3 mg/dL. The client with a mild degree of renal insufficiency would have a slightly elevated level. A creatinine level of 0.2 mg/dL is low, and a level of 0.5 mg/dL is just below normal. A creatinine level of 3.5 mg/dL may be associated with acute or chronic renal failure. 22. Answer B. The normal prothrombin time (PT) is 9.6 to 11.8 seconds (male adult) or 9.5 to 11.3 seconds (female adult). A therapeutic PT level is 1.5 to 2.0 times higher than the normal level. Because the value of 35 seconds is high (and perhaps near the critical range), the nurse should anticipate that the client would not receive further doses at this time. 23. 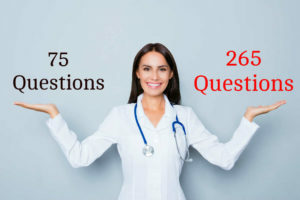 Answer D. The normal activated partial thromboplastin time (aPTT) varies between 20 and 36 seconds, depending on the type of activator used in testing. The therapeutic dose of heparin for treatment of deep vein thrombosis is to keep the aPTT between 1.5 and 2.5 times normal. Thus, the client’s aPTT is within the therapeutic range, and the dose should remain unchanged. 24. Answer C. The normal serum lipase level is 10 to 140 units/L. The client who is recovering from acute pancreatitis usually has elevated lipase levels for about 10 days after the onset of symptoms. This makes lipase a valuable test in monitoring the client’s pancreatic function because serum amylase levels usually return to normal 3 days after the onset of symptoms. Option C is the only option that contains a value just below the upper limit of normal. 25. Answer C. The normal hemoglobin level for an adult female client is 12 to 15 g/dL. Iron deficiency anemia can result in lower hemoglobin levels. Dehydration may increase the hemoglobin level by hemoconcentration. Heart failure and chronic obstructive pulmonary disease may increase the hemoglobin level as a result of the body’s need for more oxygen-carrying capacity.